Nearly a third of U.S. social media users post, like or share content via their social channels more than 10 times every day, according to a recent survey released by business news site The Manifest. The Manifest survey, which sought to assess Americans’ social media usage and interactions, discovered that nearly all social media users (86 percent) use their social media channels at least once a day, and 30 percent said they interact on social media in some form more than 10 times a day, be it in terms of liking, posting or sharing content. Interacting with other people’s content (liking and sharing) seems to be the most important social media activity, cited by nearly half of social media users (48 percent), which was nearly twice as popular as the activity of sharing their own content (24 percent). However, virtually all social media users (94 percent) said they post content to their social channels at least sometimes, and nearly half (42 percent) said they do so daily. When it comes to what content users like to post, a majority said images remain the most commonly uploaded content (69 percent), followed by life updates/announcements and videos (47 percent and 46 percent, respectively) and opinions (42 percent). Quotes and events bottomed out the list, at 39 percent and 36 percent, respectively. Facebook remains by far the most popular social media channel: more than half of respondents said they use Facebook more than any other social platform to share their own content (52 percent) as well as to like/share someone else’s content (54 percent). This was distantly trailed by YouTube (16 percent) and Instagram (14 percent). Snapchat and Twitter followed with six percent each. The Manifest’s “2019 Consumer Social Media Survey” polled approx. 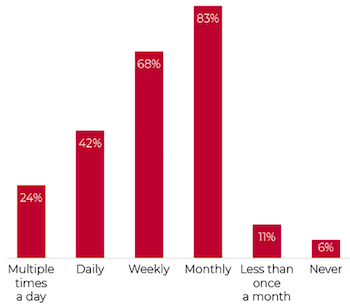 630 U.S. adults who said they use social media at least once a week. The Manifest is the sister site of D.C.-based research and consulting firm Clutch.